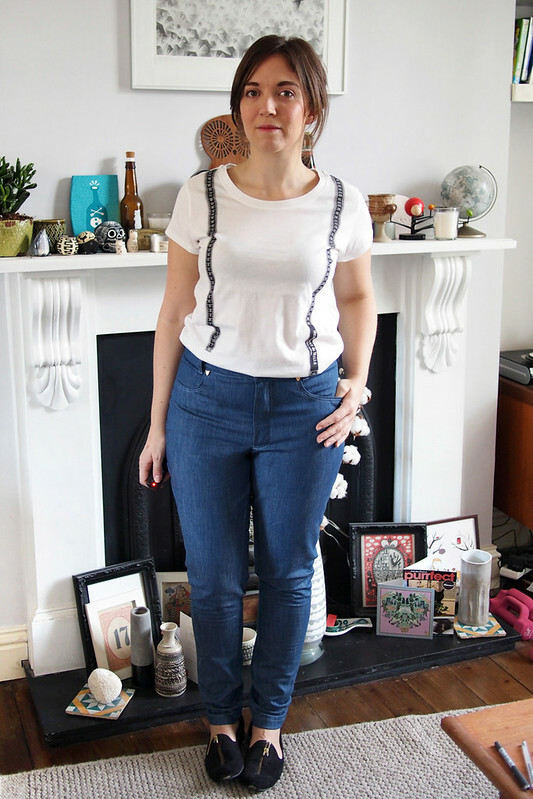 When I made my first pair of Ginger jeans, I knew it wouldn’t be long before I had another go. I whipped out two more pairs right after getting those fast-gratification overlocker projects out of my system. You’ll perhaps remember I said I printed view A (low-rise stovepipe leg) by accident last time instead of view B – so this time I did manage to print the correct view and try the high-rise skinny leg option. I made these two pairs in quick succession, and it’s interesting to compare the results using two fairly different fabrics. I jumped in to the first pair without a toile, feeling pretty confident that the fit would be close enough that I could make some on-the-fly changes to perfect ’em. The fabric for this first pair is a lovely light-medium weight denim from Cloth House‘s Soho shop with only about 1% stretch, so I cut a straight size ten all over to compensate. I’m pretty happy with the fit! The legs are unaltered and the perfect amount of skinny for me. I took my usual wedge out of the CB yoke and curved the waistband more to account for my comparatively small waist (not quite enough actually as they are still a bit loose at the waist). There will always be wrinkles in a fabric with little stretch, so I’m not losing sleep over them. I didn’t use special topstitching thread this time, just a pale blue regular thread, so it isn’t super great looking but I do love the scallop detail on the back pockets, which is just one of my machine’s built-in stitches. Pretty and zero effort! Umm, the leopard head rivets? I found them on eBay and was just desperate to use them, even though frankly they look a bit silly on this pair. I’m pleased with the finish inside, where I tried a few new techniques to get a more luxe result. The seams are flat-felled where possible: at the crotch, yoke and inseam. 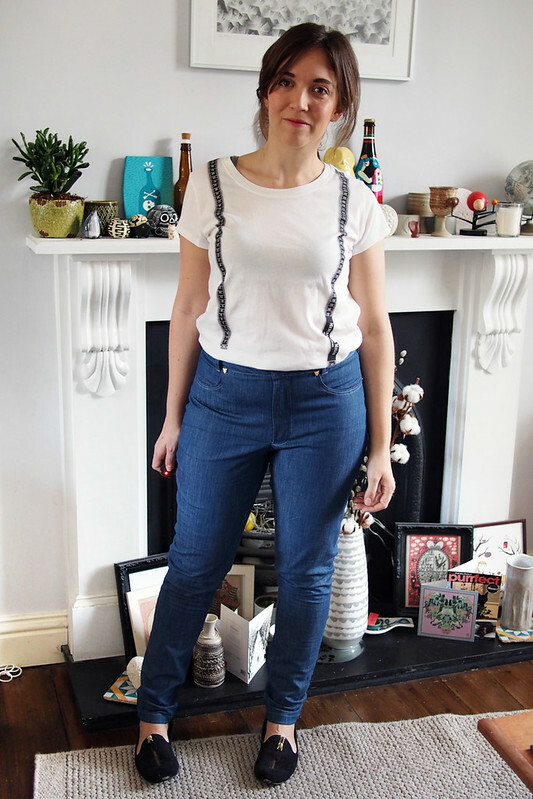 I thought flat-felling would be a real extra effort but it’s not too bad at all and really makes the jeans feel more special to wear. I also included a pocket stay/extension, drafted using the great directions here and made from a leftover scrap of tana lawn. I would bear in mind that if your denim has stretch, you’ll want to pick a fabric for the stay with the same kind of stretch. I think this rigid lawn against my stretch denim is causing slight pulls across the stomach area. I made up a second pair immediately to fix my minor fitting issues, grading the waist down a size and curving the waistband some more. This pair uses another Cloth House fabric, but it’s a super stretchy twill which I think is better suited to the pattern. 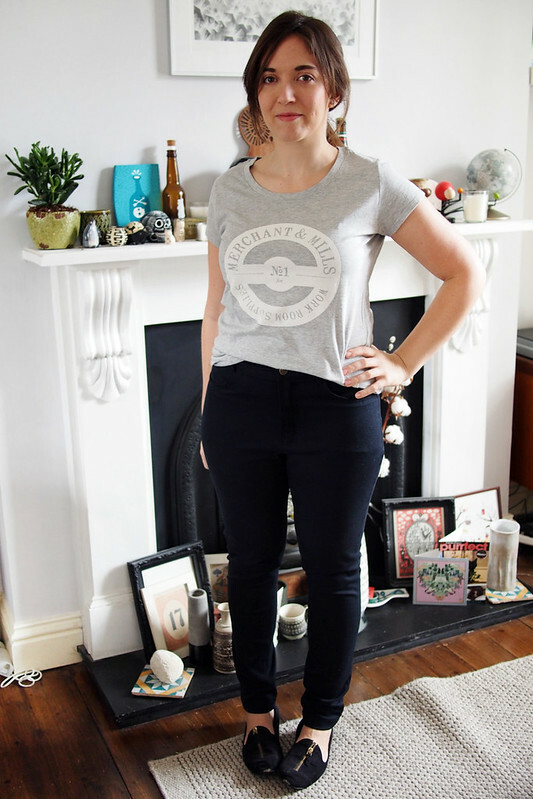 It’s got a kind of brushed moleskin finish on the inside so they feel absolutely amazing to wear – like plushy, cosy leggings. Also not to toot my own, but I nailed the fit, right? *fist pump emoji* I could get super fussy about the crotch and back wrinkles, but these are as close to perfect as it’ll get I think. In fact these are probably one of the top five things I’ve made – I think they sweep the board of well-made, good fit, and a totally wearable wardrobe classic. 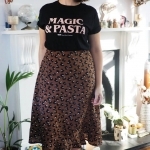 And they were super enjoyable to make to boot – I love working with black on black for some reason (though good daylight is a must) and took the effort to make flat-felled seams and pretty topstitching even though it’s barely noticeable. Thank you Heather Lou for enabling my dream jeans! no wonder they are in the top five, they look great! Great fit! 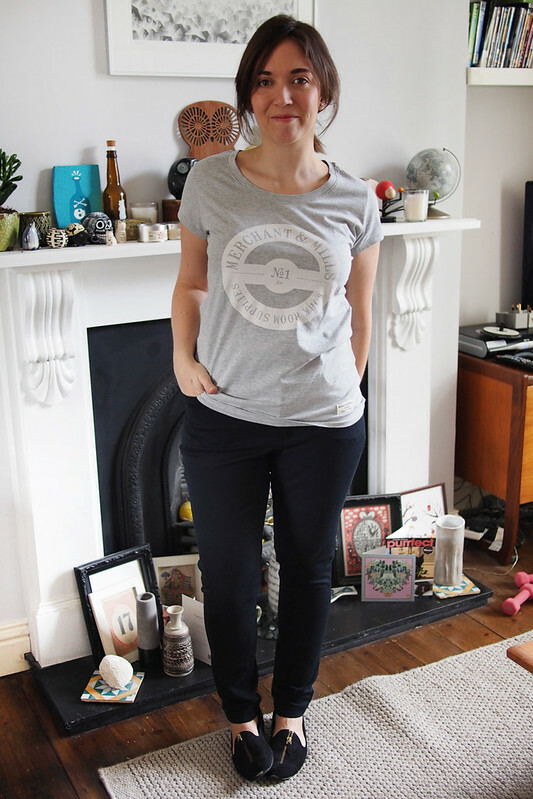 I am wearing a merchant and mills tee too at the moment. The beeswax one! Wow! They both look great – but, yes, that black pair is especially perfect fit-wise! I love all the sweet little embellishments on the denim pair though! Great job! So fun aren’t they? I want to make a really 80s light wash pair and put these all over. Aren’t they good? 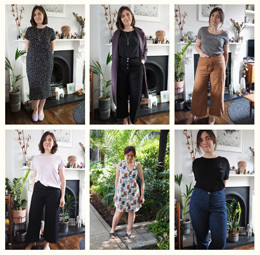 I went a bit mad with the Merchant & Mills for Uniqlo collection! REALLY love the black pair. 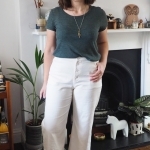 I have just cut out my first pair, using your burgundy denim. Ooooh can’t wait to see, I hope you love them. So true! 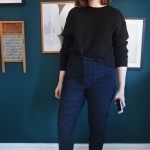 My old pair of black Burda trousers are one of my most-worn handmades, too. I do fancy a pale denim pair for spring though. Amazing! They both look fabulous! 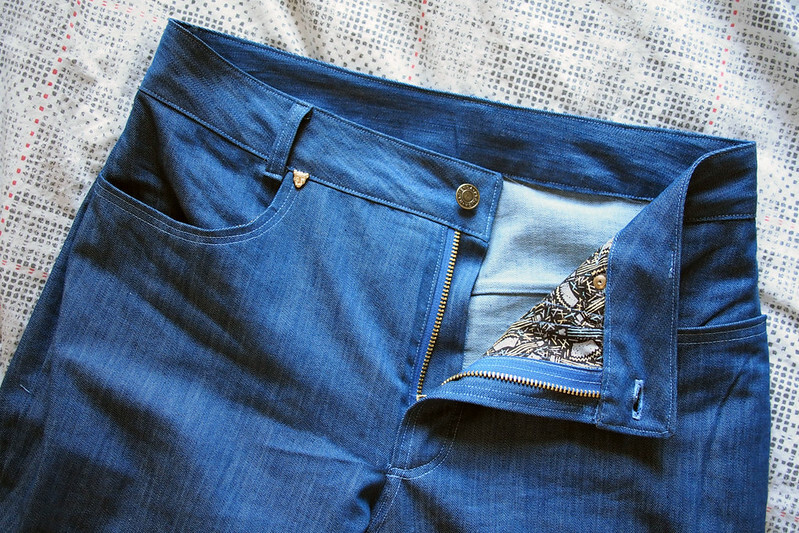 One day I hope to have the skill to make jeans! A year ago I never thought I’d make jeans either! They look great! Next time, cut your pocket stays on the bias and they’ll have plenty of give. That’s a superb tip, thank you! The black pair look amazing. So RTW. 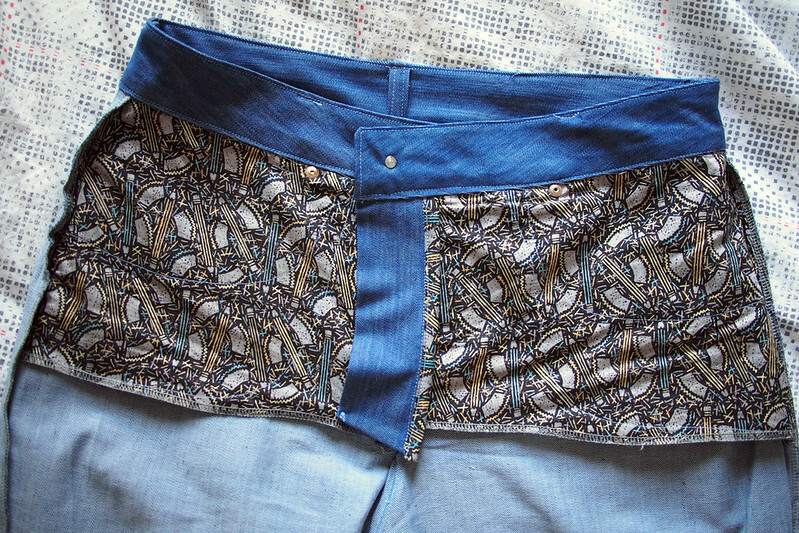 I’ve just cut and started sewing my first pair of Gingers in very dark blue denim. They don’t actually take that long to sew do they? 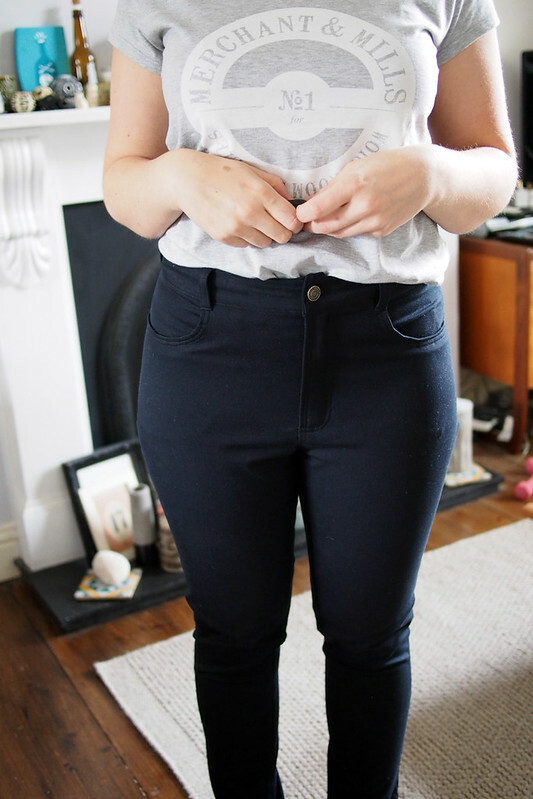 It’s just the scary notion of jeans sewing that puts you off. Thank you. No they don’t take long, especially when you’ve done it a few times. I had the black ones done in a day! What’s the sizing like on those Merchant and Mills T-shirts? I can’t decide if I should order a medium or a large and the online size guide isn’t working. Sorry to ask – thanks so much! I’m wearing the medium… I’m a 10/12 in RTW and it’s a loose-ish fit. Hope that helps! I love both of these, but the fit on the black ones is amazing! You totally nailed it. I love those cute little rivets on the first pair too! Wow, the blue ones look good but the black are a total knockout! Great jeans Katie! Makes me want to finally try the Ginger pattern myself. I’m not sure the world could cope, it’d be too bangin’! Wow loving the darker pair on you so neatly sewn too tres chic! Also wearing my M & Mills sweat shirt today too! love these! I’ve been on a bit of a Gingers kick, too – got two more fabrics in the mail! After fitting the waist similar to how you did, I’m now figuring out those back wrinkles. I actually fixed my front crotch wrinkles by using the front crotch curve from the low-rise version. For some reason it’s longer on the high-waisted one, and left extra fabric for me. Then, today I was making leggings and realized shortening the back curve at the crotch eliminated wrinkling in the back. So maybe I’ll be trying that on my next pair. Interesting – I was meaning to compare the two patterns and see if they differ in that area. Minute tweaks to the curve might do the trick. Yes indeed you have nailed it! Ah, these are both amazing! And I have to get to Uniqlo…..
That black pair is the spitting image of my AG Farrahs! The difference is, I bought mine, and you probably didn’t spend an arm and a leg to make yours! They are my most worn pair of pants though, by far. And to think, I was hesitant to purchase them…. I hope you get just as much use and joy out of them as I have! Yes I think my fabric was about a quarter of the price! They are already my go-to pants, so I hope the fabric holds up well. I learned my lesson with the pocket stay too! My first one was non stretch and it was so effective that I popped off the top button because there was too much pressure there because of the intense pocket stay. I did a slight stretch one and it’s awesome! I love your black ones, I’m inspired to make a pair like that now too! Wow! The fit and the fabric on the dark one is spot on. Well done! YA GIRL! Killing it with these. They are beautiful inside and out! These are both really great, I’m a bit in awe of your skills! I know I could technically make jeans, it’s the fitting I’m scared of. I actually am pretty sure I have the exact same stretch black fabric from cloth house! Its lush! 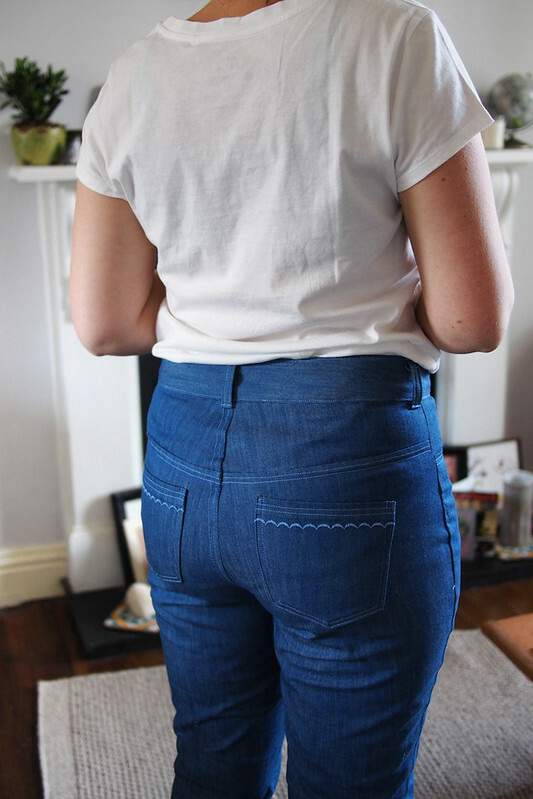 Quick q for you on the jeans- did you make them with an inch of negative ease like in the pattern? I’m scared of negative ease! Thanks! Yeah, you can trust the negative ease – my measurements spread between 3 sizes of the size chart and the lower/middle end of the range fit me well, especially in the super stretchy black pair. You can always claw a bit back from the seam allowances too!